Our Twist Ties have a thin metal wire encased in a strip of plastic or paper used to securely close the openings of a bag such as trash bags, cellophane or bread bags. 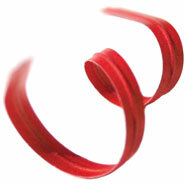 These Twist Ties are available individually in pre-cut 4", 5" 6" & 8" lengths, or on large spools. The plastic or poly Twist Ties withstand water better than the uncoated paper versions. Water-resistant Twist Ties are sometimes used to package ice, vegetables, and other produce. Different sizes and strengths are used for different applications.